Somehow I ended up a citizen of three amazing countries. I’m writing this post to say thanks for that, and to note down the impressive UX of applying for a new UK passport. As a citizen of Canada, Ireland and the UK, I’m lucky, and very conscious that there are many around the world who would sacrifice a lot, just to be a citizen of any one of these countries. Growing up in troubled Northern Ireland, I didn’t always feel lucky. I’m sure admitting that even now offends some people. There was bitterness from both sides of the divide that I can still feel vividly decades later. It was hard for me to feel proud of being either Irish or British. It has taken my lifetime to recognize the beautiful aspects of my origins and culture. I think a lot of people take time to piece their own jigsaw together. Yet, as peaceful as Northern Ireland miraculously is at the moment, there are still individuals within it who cling to the divide. Peace there is delicate, and vulnerable to the decisions made for Brexit. I made my own personal Brexit a long time ago, when I decided to make a life in Canada. And I feel that I belong here. I hope and wish that we can all experience a definite feeling of geographically, and culturally belonging. Although I think it might be time to move away from Ottawa, and think about the warmer West Coast of Canada. I love Ottawa, but the winters are really taking a toll on me now. Since settling here in Canada, I’ve exclusively traveled with my Canadian passport. I am on my second edition now. I haven’t renewed my UK passport since it expired six years ago. Recently, a series of events led me to needing it again - related to my past employment, and future pension. It used to be the case that I would have to visit the British Embassy in Ottawa. This time there was a new beta version of a passport application process that was entirely online. Even the photograph could be taken at home against a white wall. When uploaded, the picture is tested for shadows, and cropped to the necessary size and shape. The directions were very clear, and didn’t feel overwhelming. Each step of the application explained what came next. The process texted to remind me to mail the accompanying documents. Then texted me when they were received, when the passport was approved, when it was dispatched, when it arrived. I was immensely impressed at how well done the user experience was. It wasn’t glossy, or domineering. It was very well balanced, if anything it felt like it was on my side, clear and minimal. My three passports feel like three chapters to some extent. Three periods of my life that began and ended. With my recent trips to London, and holding this UK passport in my hand, I am realizing that the three passports are ongoing, those identities are ongoing, and still alive too. They’re in my accent. They’re in the choices of music I listen to, the food I choose to eat, the books I read, the podcasts I listen to. The tea I drink! In the past year I’ve been thinking more about my time in the UK, I suppose as Brexit unfolds. I traveled on the channel tunnel this year. It takes very little time to reach France from England. My time in the UK was when it was part of the EU. That’s how I prefer to think of the UK. Next time I travel to the UK, I might enter with my new passport. Just to dig a bit deeper into how I feel about that part of my identity. Last year we made an experimental blockchain app that could be used at developer events, called Kubecoin. Since then it has been used at 18 events in North America, and in Europe. I’m envious in that it was used quite a bit in Scandanavia last year. Particpants using it walked over 7 million steps, and 5000km over 25 days of conferences. We had well over a thousand participants, and our idea was shared with 10s of thousands of others. The app will be used again this weekend in Istanbul. Lucky app, to travel so far. Each time it is used at an event, there is a new set of merchandise that a participant can exchange their footsteps for. 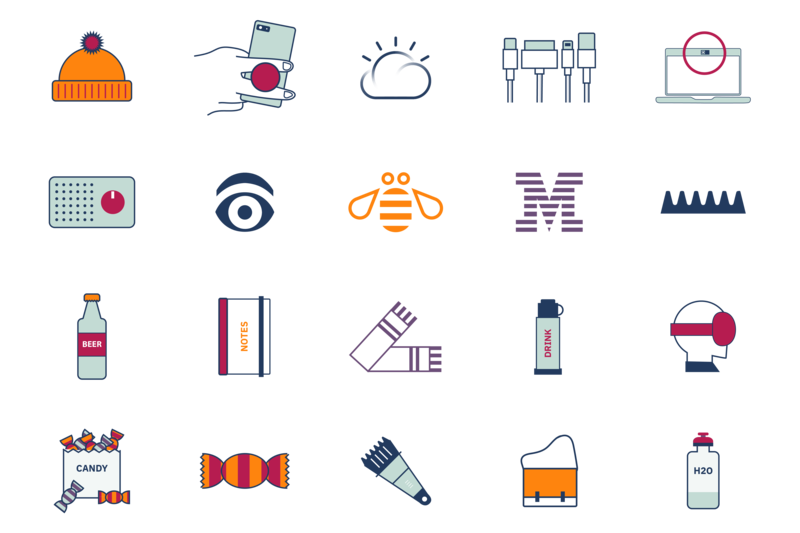 Rather than display mismatching photos of the objects, I started drawing the items to a similar palette, and style for each event’s swag store. You can see them above, most drawn quickly between meetings, or at the end of a day. Always a fun little project to return to. It is neat to see how the objects accrued on my Adobe Illustrator art boards. Even this swag is inventory controlled on a blockchain. Retail stores likely don’t have that level of inventory control! In our case, we’ve set it up to demonstrate the technology, and to show that it can be quick to do so. Of course this sophistication is unnecessary for our needs, but the hyperledger architecture allows us to segment independent events quickly and easily on a blockchain fabric. Lots of people ( I think mostly who have never actually implemented blockchain before ) argue that the technology is theoretically overkill. In my opinion, the concepts are important to understand right now. We made our system open source to show how we did it. Each time the app has been used at an event, we’ve learned something new about it - we’ve fixed bugs, improved UX, understood conference habits, or thought more deeply about the use of blockchain. Even though we don’t work on the app very much at the moment, it still makes conference appearances. The blockchain fabric has been running for over a year now. A little engineering goes a long way! Now that I’ve managed to revive my website, and blog, I’m reviving my Coldplay lyrics project. It will work in a similar fashion to the psychology of David Bowie personas project that I made a couple of years ago. 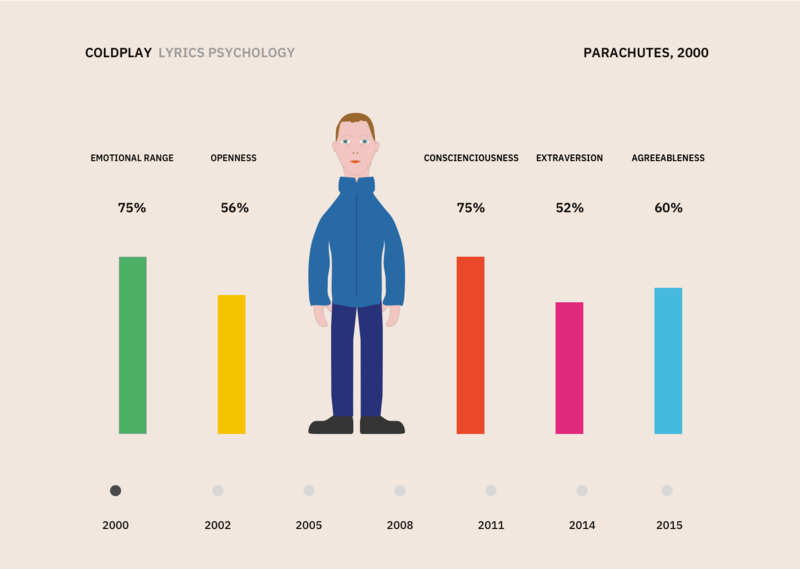 I’ll compare the change in personality of Coldplay through their lyrics from the past seven albums. I was inspired to do this when I saw them live a couple of years ago, and the project has been slowly simmering in the background. This time, I’m going to try my hand with some animations, and a sprinkling of Houdini. I’m excited to play around with a few new web apis. Hopefully I can write more about this soon!